Minimally invasive surgical (MIS) techniques, such as laparoscopic surgery and endoscopy, provide reliable disease control with reduced impact on the function of the diseased organ. Surgical lasers can ablate, cut and excise tissue while sealing small blood vessels minimizing bleeding and risk of lymphatic metastases from tumors. Lasers with wavelengths in the IR are readily absorbed by water causing minimal thermal damage to adjacent tissue, ideal for surgery near critical anatomical structures. 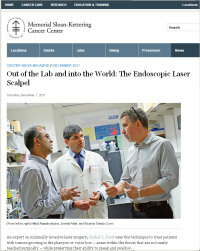 MIS techniques have largely been unable to adopt the use of lasers partly due to the difficulty in bringing the laser into the endoscopic cavity. Hollow waveguide fibers have been adapted to bring surgical lasers to endoscopy. However, they deliver a beam that diverges rapidly and requires careful manipulation of the fiber tip relative to the target. Thus, the principal obstacle for surgical lasers in MIS procedures has been a lack of effective control instruments to manipulate the laser in the body cavity and accurately deliver it to the targeted tissue. To overcome this limitation, we have designed and built an endoscopic laser system that incorporates a miniature dual wedge beam steering device, a video camera, and the control system for remote and /or robotic operation. The dual-wedge Risley device offers the smallest profile possible for endoscopic use. Clinical specifications and design considerations are presented together with descriptions of the device and the development of its control system. 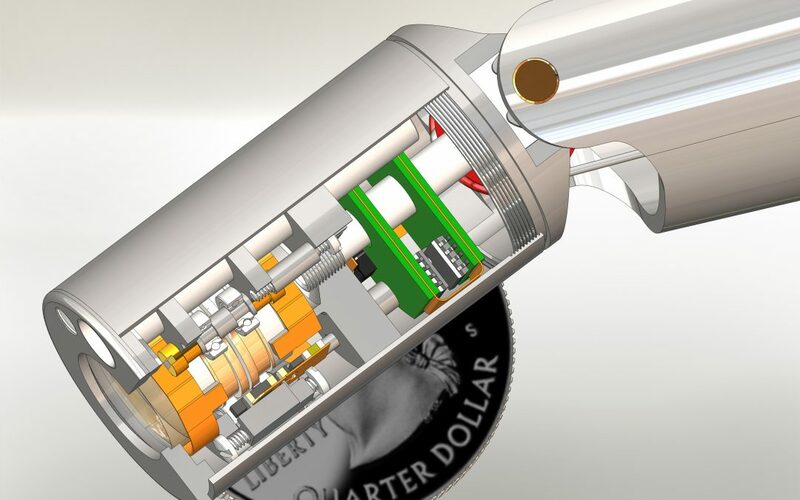 A custom rotary piezoelectric motion system from New Scale Technologies drives the dual-wedge beam steering device with high precision and smallest possible size. Cut-away view of the endoscopic laser scalpel mounted on a modified laryngoscope. Custom piezoelectric motion systems from New Scale Technologies rotate two optical wedges to steer a laser beam. The device is 5 cm long by 17 mm diameter (and can be made smaller). 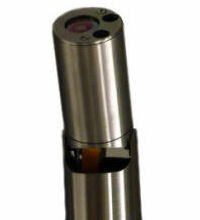 It offers the smallest profile possible for endoscopic use. The mechanical stability and accuracy is improved as the pivot point of the laser control is brought closer to the target tissue. The field of operation is widened as the laser delivery is no longer bounded by a narrow access channel as in the ‘keyhole’ procedures. The size of the focused laser spot is reduced by the numerical aperture of the ELS, consequently improving the effectiveness of the laser scalpel and completely eliminating the beam divergence of the optical fiber. The depth of operation is kept large and the need to maintain a precise distance from the tissue, as with the fiber delivery, is removed. One challenge was to design an opto-mechanical device small enough to fit into the body cavities. The team avoided mirror-based laser steering mechanisms in favor of a transmissive steering device (the Risley prism pair) to maintain the small profile needed for endoscopic insertion. To accomplish this, the team needed a small and accurate motor with sufficient accuracy, precision and power to move the optics. The team designed a prototype based on piezoelectric technology from New Scale Technologies. New Scale produced the prototype. The actuators have custom piezoelectric motors with ASIC drivers and position transducers with differential hall sensors from New Scale Technologies and ams. The servo loop is controlled with a microcontroller. Each optical wedge can rotate clockwise and counterclockwise with variable speed and acceleration to precise angular positions. The beam can be scanned over any point in a circular area with a diameter twice that of the single wedge scan. Request a copy of the paper from New Scale or purchase it from SPIE Publications. The paper presents clinical specifications and design considerations of the laser scalpel, together with descriptions of the device and the development of its control system. Contact New Scale about integrating piezoelectric motion systems into next-generation medical systems.